Nathanael King: Jesus Loves Santa, and So Should You! Why did Saint Nicholas give with such generosity? It’s because he knew of the greatest gift given to all humanity. He loved because God loved him and the whole world! God’s love overflowed in his heart, so the story is told. Jesus, the greatest gift for every man, woman, girl and boy! But Jesus fixed that when he died and then he rose again! Saint Nicholas also longed to show love to everyone! Remember the love that is behind it all. Express THANKFULNESS! Please never forget! It’s the expression of love that I hope makes your heart warm. As Santa would say, Merry Christmas to you! May you know God’s love for your whole life through! While I like most of the post, I take issue with something that you said. There was a comment in the post that says something like, "so it's not really a lie" ... there is no such thing as something being "not really a lie". If you let your kids believe in Santa, that is GREAT! (that is not lying). But if you tell your kids Santa exists (as in he exists to this day) that is a lie. If someone is given a gift under the tree that is from Santa, that is a lie. Elf on the Shelf is also lying (in my opinion) . We are commanded not to lie so I can understand how some would feel pretty strongly about this, but again, that doesn't mean they are high strung, rather just filled with conviction. Just because the GenPop does Santa, doesn't mean everyone has to do it or even that it is right. I'm pretty sure Jesus went against what the general population thought was right in His time and made some waves but was He wrong? I'm not comparing myself to Jesus, or anyone that doesn't "do" Santa for that matter, what I'm saying is that just because the majority goes along with something doesn't make it right. And if people stand against it, that doesn't make them wrong or mean they are taking away any of the magic. Now, let me explain something. I don't "do" santa with the kids but what I mean by that is that I don't perpetuate the lie - this was something my husband and I felt very strongly about. We wanted our kids to know that we always tell them the truth. My son (8) asked about santa about 3 years ago and we explained the truth, which is much like the poem Banana Bear posted, until then he believed in Santa and what the stories made him out to be. Now he understands who Saint Nick was and that Santa the people's way of spreading his christmas cheer. My daughter (4) believes in Santa. None of our gifts are given from Santa, I think we have one Santa decoration, and we watch the Polar Express and all the fun Christmas movies, etc. Santa is not banned from my house. My daughter talks about Santa and I don't say, "Santa is just pretend." I also don't tell her mickey is pretend or cinderella is pretend. We don't talk about how they better be good bc Santa is coming or anything like that. When my daughter asks me whether Santa is real or not I will explain it and talk it through just like I did with my son in that Santa was Saint Nick who loved Jesus and did great things for boys and girls but that he lived a long time ago and that now people want to spread that same joy and cheer through Santa Claus. I take issue with the comment about it not "really" being a lie because there is no such thing. Great article! It always encourages me when people are able to present reasonable arguments instead of resulting to anagram-based retorts. And I hope you'll allow me to present a few comments, as I came from the other side. I believe that it's dangerous to compare Santa to a parable. I understand the principal there, but there is a key difference: Santa is not presented as a story. A parable doesn't eat cookies, write letters, rip pants, or leave presents. In my mind, this borders on deception (albeit with good intentions). I believe this could take credibility from stories that really are true. After all, if the story about a jolly man who brings presents isn't true (despite the evidence), why would a story about a man who died 2000 years ago be any more true? Granted, this is just conjecture on my part. The comparison between Aslan and Santa is also a bit tenuous. Aslan is a character that was specifically modeled after Jesus - that was the author's base intention. 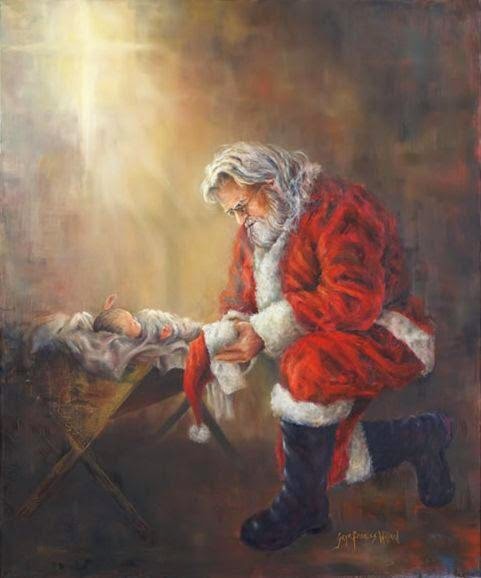 While Santa does carry several Christ-like qualities (and St. nick certainly appears to have been a man after Christ's heart), he is not directly modeled after Christ. I understand that, with tact, one could use Santa to teach children about grace and Christ's benevolent character, but it would be a major stretch from the consumerism-based Santa the media projects. I believe there are better ways - which leads into my final point. The magic and wonder of Christmas doesn't rely on Santa. Seriously. Growing up, I knew my gifts came from my parents - and I believe that I learned more about grace from that than any of my friends who thought they were from Santa. There was no fooling my parents - they knew exactly how I behaved through the year, and I knew it too. I also knew we didn't have much money, and I appreciated their generosity even more. I learned about Christ's character from watching them. But the magic and wonder isn't limited to presents. Christmas is a time when people decorate their homes with fun lights; it's a time when people give away free cookies at the petting zoo; it's a time when people move past their ordinarily drag demeanor and smile at each other instead. For a month out of the year, my community became a truly wonderful place. And while everyone may not have the same experiences as I did, I believe that there is a lot more wonder to be had around Christmas than just Santa, if you take the time to look. Ultimately, we all have to rely on the Spirit to lead our kids into all truth, and I honestly believe that it's possible whether we do Santa or not. Hi Accident, Here's a couple of thoughts in response. In regards to your first point, Santa could very well be presented as a story. In my mind, it depends on the presentation. But secondly, the difference between a Santa and a parable are not all that different. When Jesus told parables, he often included elements of reality (think the good Samaritan). He used real and believable situations and geographical places. He didn't completely remove the parable from reality. Further, it's extremely likely that there were children present when He taught with parables. Do you think He took the time to distinguish and explain, "Now kids, this didn't really happen. I'm just telling you this to communicate a bigger truth?" I don't think so. So was he deceiving those children who couldn't distinguish the story from reality? I don't think so. In regards to the point about Aslan, it seems to me that your point entirely depends upon whether you present a Santa that loves Jesus and seeks to honor Jesus (more in line with the historical St. Nicholas), or a Santa who has been hijacked by advertisers. I'm encouraging people to present the former to your children.